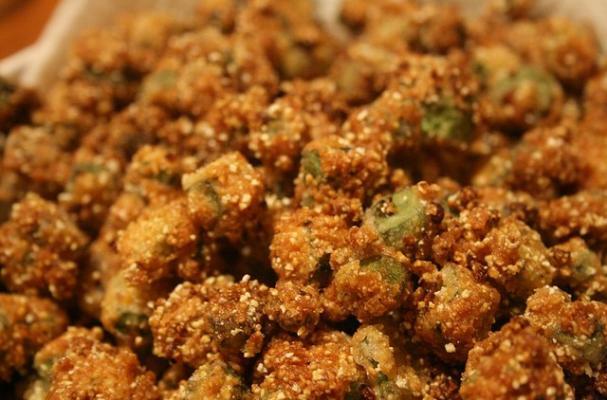 You've heard of popcorn chicken and zucchini fries but have you tasted the joys of fried okra bites? Okra is used extensively in southern cooking (i.e. gumbo) and this recipe is a delicious way to enjoy this vegetable. Slices of okra are coated and deep fried until golden brown. Serve your crispy okra bites with Sriracha mayo for maximum pleasure. Dip okra into egg. Roll in cornmeal to coat. Deep-fry at 365 degrees until brown. Drain and serve hot.